Pour sparkling wine into a 2 quart bowl and allow to sit while preparing the simple syrup. Combine water and sugar in a small saucepan. Set saucepan over medium heat and bring mixture to a boil, stirring to dissolve sugar; let simmer 5 minutes. Remove from heat and allow to cool for 10 minutes. Add sugar mixture, orange juice and lemon juice to sparking wine, stirring until well mixed. Cover and refrigerate until very cold, at least 2 hours or overnight. 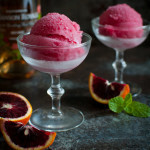 Transfer the mixture to an ice cream maker and freeze according to the manufacturer’s instructions until sorbet is the consistency of thick slush. Then, transfer the sorbet to a freezer-safe container, cover and freeze until firm, 3 to 4 hours. Scoop sorbet into serving glasses and garnish with mint leaves, if desired. Recipe courtesy of Chef Jami Martino.